How to get Microsoft Surface Data Recovery when your computer isn’t powering on? Having an issue with a Microsoft Surface and your data is not backed up? There may be a solution to get your data back. Since 2012, Microsoft has been producing a series of four generations of touchscreen personal computers, the Microsoft Surface. The internal storage in Surface computer is SSD storage in some of the models, the SSD is removable and in some other models, there is no actual SSD drive in the device. Instead there is an onboard, non-upgradeable or irreplaceable solid-state storage. Solid state drive options on Surface include 128GB, 256GB, 512GB, or 1TB. Given the design of the Surface, in particular that of the slim tablet, and the presence of a encryption technology based on the TPM chip, when there is an issue with it, it can be quite complex to get the data stored on the machine recovered. 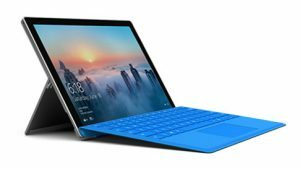 Whatever the type of Surface device you have, whether it is one of the Surface line of hybrid tablets, the latest model of the Surface Go, the Surface Pro line of professional hybrid tablets, the Surface Laptop, the Surface Book, the Surface Studio all-in-one desktop or the Surface Hub, the touch screen interactive whiteboard, there may a solution to help you get your data back. Many say that a Surface computer isn’t meant to be opened or repaired and it even scored a 0 out of 10 in term of user repairability. There are no screws on the back of the machine, it’s just welded and that can make it hard to open with the correct tools. If the SSD is not removable, as it is the case with Surface 3, for example, where the SSD is soldered, with an encrypted chip, onto the motherboard, fixing the motherboard will be the only solution available to get access to the data. This means powering the board in order to have access to the drive if integrated on the motherboard. If the SSD is a PCI removable NVM Express (NVMe) type of drive, the Surface can be opened, the drive removed and plug onto a data recovery software such as PC 3000. This will enable the technician to have access to the data even if the device has an encrypted Bitlocker partition that needs to be unlocked. Creative IT intervenes in cases on disk error loop, when there is a need to recover deleted files and photos on Microsoft Surface, when the Surface needs to be restored to factory settings or if the Surface no longer powers on. Creative IT has all the necessary recovery tools to access the SSD storage on the Microsoft Surface and help you get your data and information back. The drive is encrypted and you will need to have your Microsoft ID in order for the technicians to decrypt the data recovered. If the storage is on the board, we will attempt to repair the board for data recovery purposes. For more information about Creative IT’s Microsoft Surface data recovery services, call now on 020 7 2376805.